Turning is a form of machining, a material removal process, which is used to create rotational parts by cutting away unwanted material. The turning process requires a turning machine or lathe, workpiece, fixture, and cutting tool. Turning is an engineering machining process in which a cutting tool, typically a non-rotary tool bit, describes a helical toolpath by moving more or less linearly while the workpiece rotates. The tool’s axes of movement may be literally a straight line, or they may be along some set of curves or angles, but they are essentially linear. Turning is generally a 2D cutting process that makes cylindrical parts. 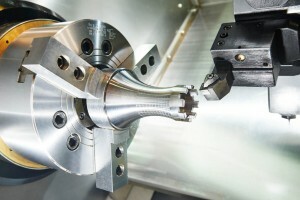 But with CNC control of axis translations, the usefulness of lathe can be greatly improved. All the complex 2D circular and conical shapes can be done just by running a G code. CNC USB controller supports spindle encoder and index signal for spindle synchronization that is needed in threading cycles, so all passes of thread cutting starts and ends at the same spindle orientation. Planet CNC USB software supports tool nose radius compensation codes, so there is no need to offset a programmed toolpath in chamfers or radius on the contour. The toolpath simulation shows you exactly how the part will be machined. How to setup CNC machine using PlanetCNC software and controller?